1. 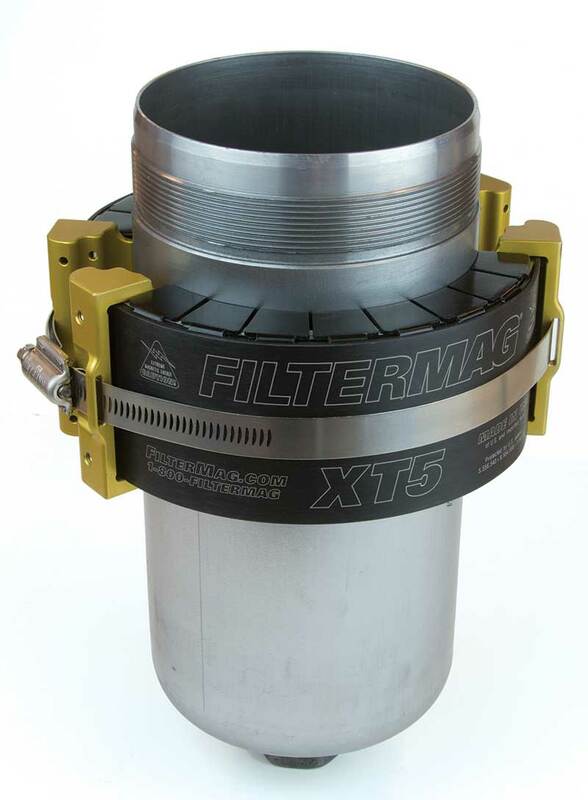 The FilterMag XT is designed for permanent installation on cartridge style oil filter housings with diameters from 3.8”–8.8” (96mm–224mm). NEVER ATTEMPT TO PRY OFF A FILTERMAG WITH A SCREWDRIVER. It won’t work, you’ll destroy the magnets, void the warranty, and ruin your screwdriver. 2. Be aware of your surroundings. Keep metallic objects away from the XT to prevent loose parts from being suddenly attracted to the magnets. Keep away from metallic objects (such as pipes or other canister filters) that could unintentionally attract the XT. 3. 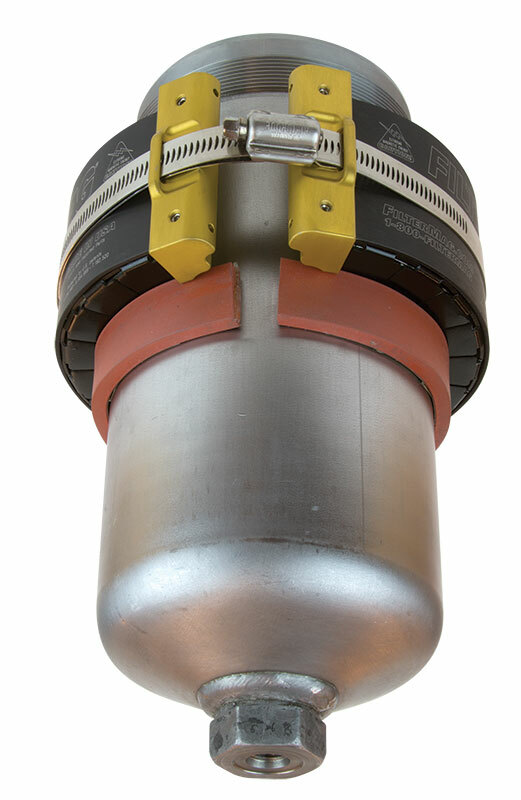 The XT mounting location should be clean and free of any particulate contamination. Clean any contamination that would become trapped between the XT and canister surface. 4. Wear gloves and safety glasses. The XT’s magnetic attractive power is overwhelming. Planning and maintaining control of the XT is essential for proper and safe installation. 1. Make sure you have ample room to maneuver the XT into position. 2. 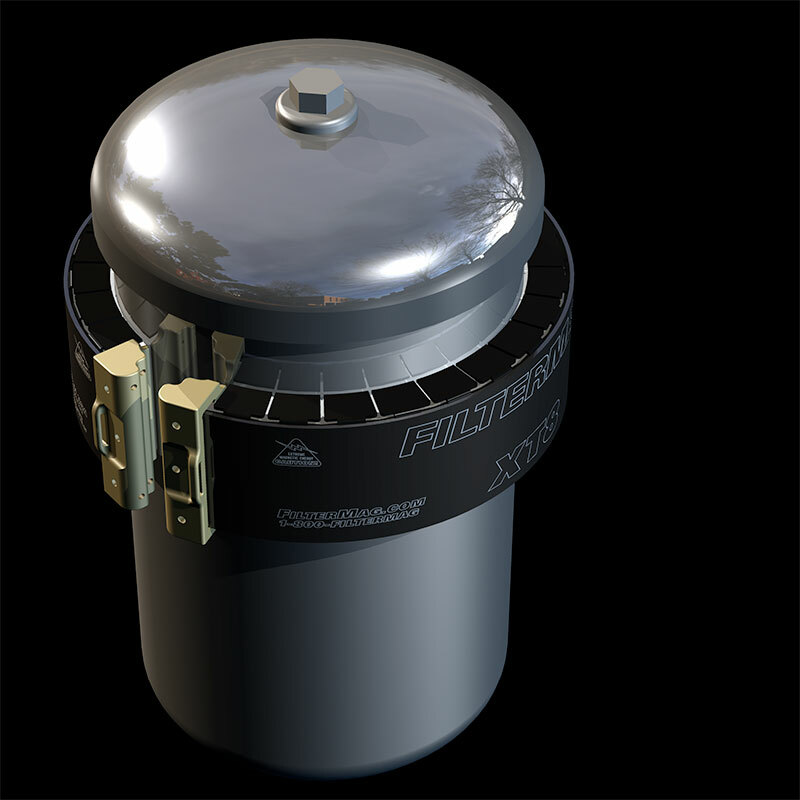 Choose a location for installation near the open end of the oil filter housing. Make sure you’ll have room later to service the filter cartridge. The FilterMag XT is not removable. When replacing the filter cartridge, reach inside the housing with a clean, dry, lint free cloth and wipe away the particles captured by the XT. 1. Wear Gloves and Safety Glasses. 2. Hold the XT by the edges as shown. 3. Check to make sure your fingers are not between the XT and the oil filter housing. 4. Position the XT near the intended installation location. As you get close to the oil filter housing, the FilterMag’s powerful magnets will suddenly pull the XT onto the housing. Correct way to hold the XT during installation. 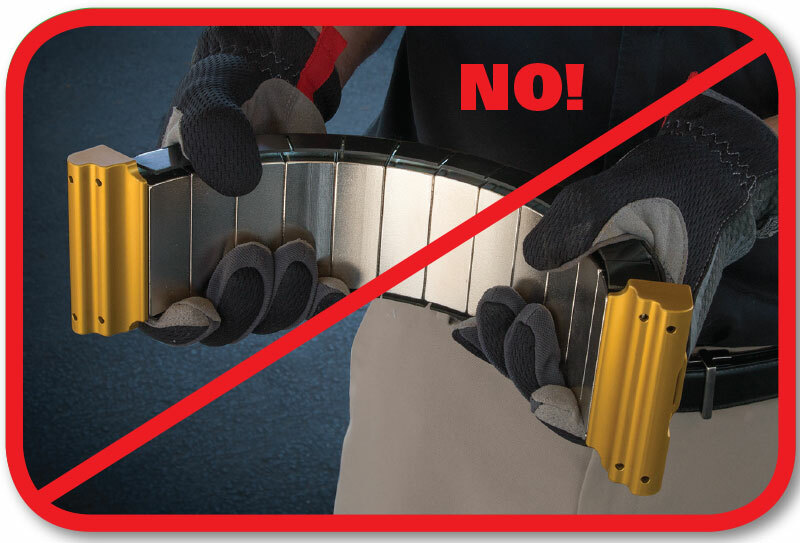 Don’t let your fingers get between the magnets and the filter housing or serious injury could result. 1. Screwdriver or nut driver to tighten stainless steel band clamp. 2. 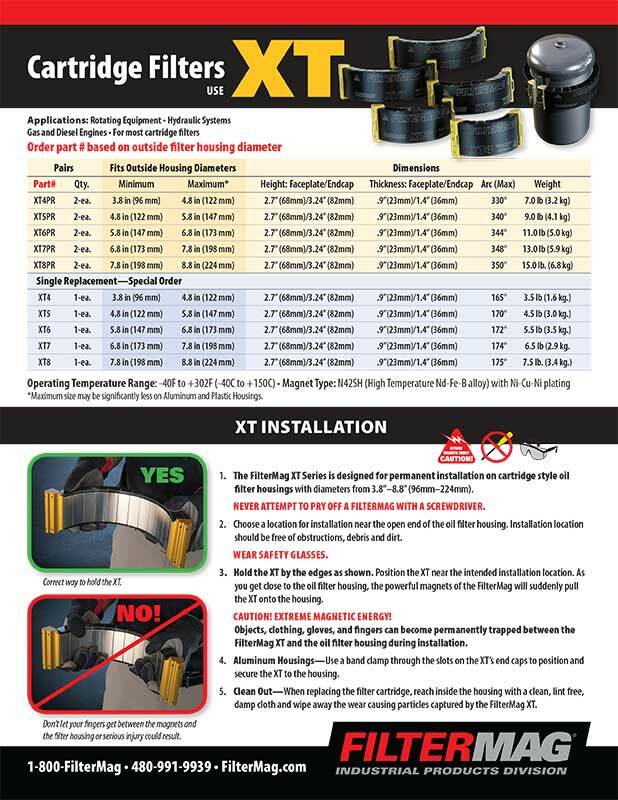 Adjustable bar clamps or ratcheting strap clamp to pre-position FilterMag XTs when being installed by one person. 1. 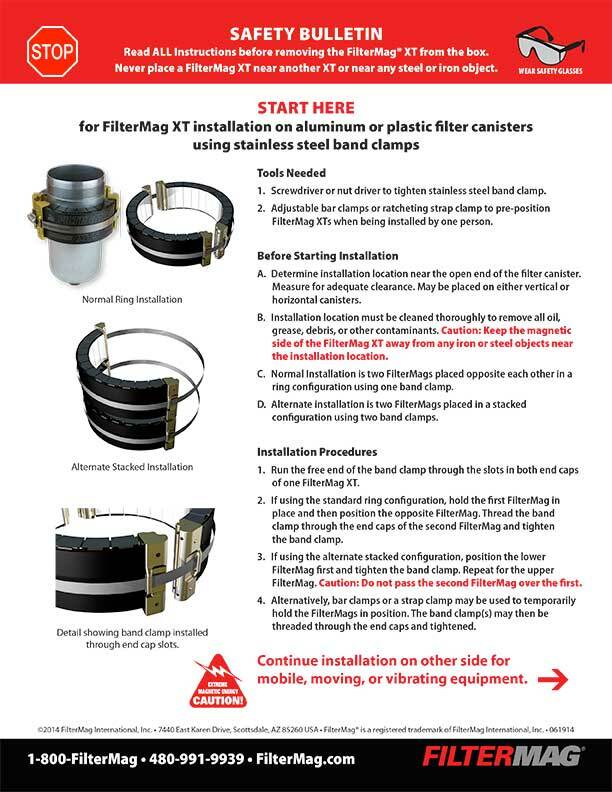 Determine installation location near the open end of the filter canister. Measure for adequate clearance. May be placed on either vertical or horizontal canisters. 4. Normal Installation is two FilterMags placed opposite each other in a ring configuration using one band clamp. 5. 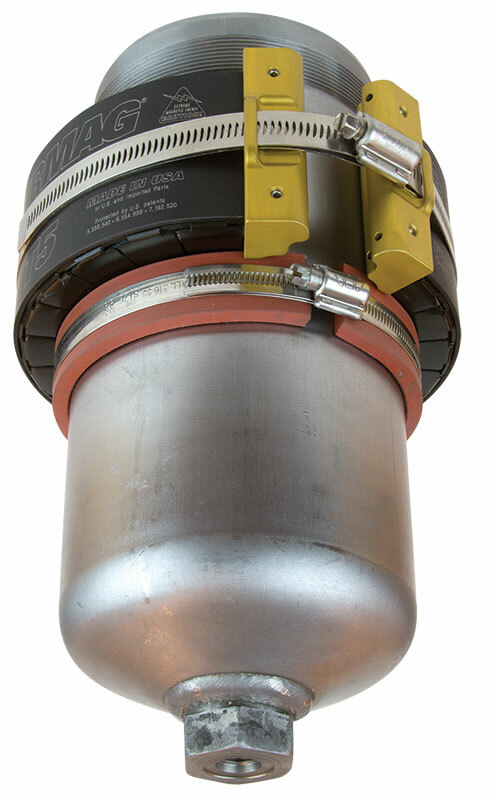 Alternate installation is two FilterMags placed in a stacked configuration using two band clamps. 2. Run the free end of the band clamp through the slots in both end caps of one FilterMag XT. 3. 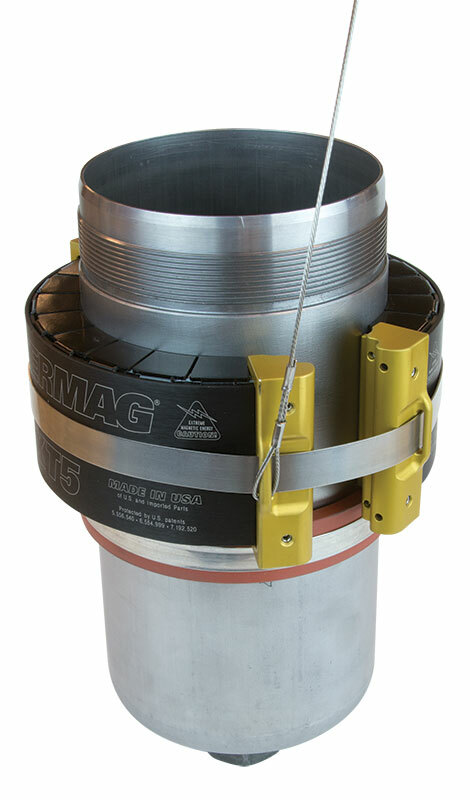 If using the standard ring configuration, hold the first FilterMag in place and then position the opposite FilterMag. Thread the band clamp through the end caps of the second FilterMag and tighten the band clamp. 4. 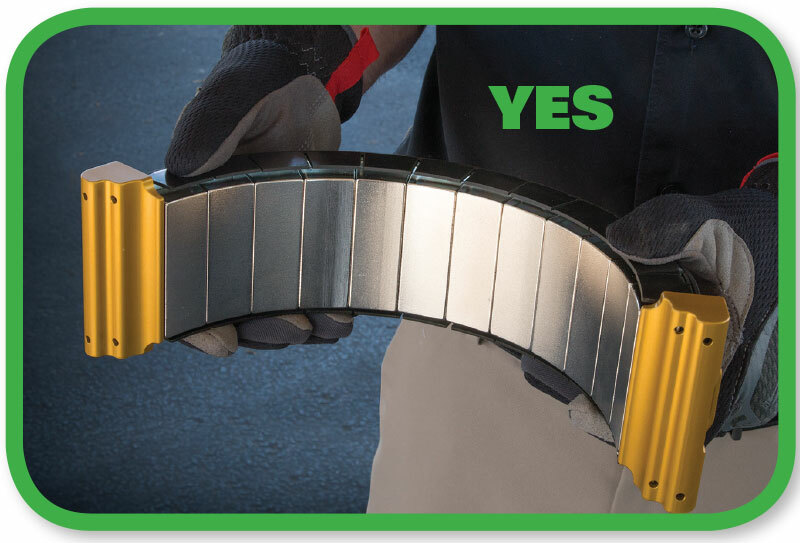 If using the alternate stacked configuration, position the lower FilterMag first and tighten the band clamp. Repeat for the upper FilterMag. Caution: Do not pass the second FilterMag over the first. 5. Alternatively, bar clamps or a strap clamp may be used to temporarily hold the FilterMags in position. The band clamp(s) may then be threaded through the end caps and tightened. 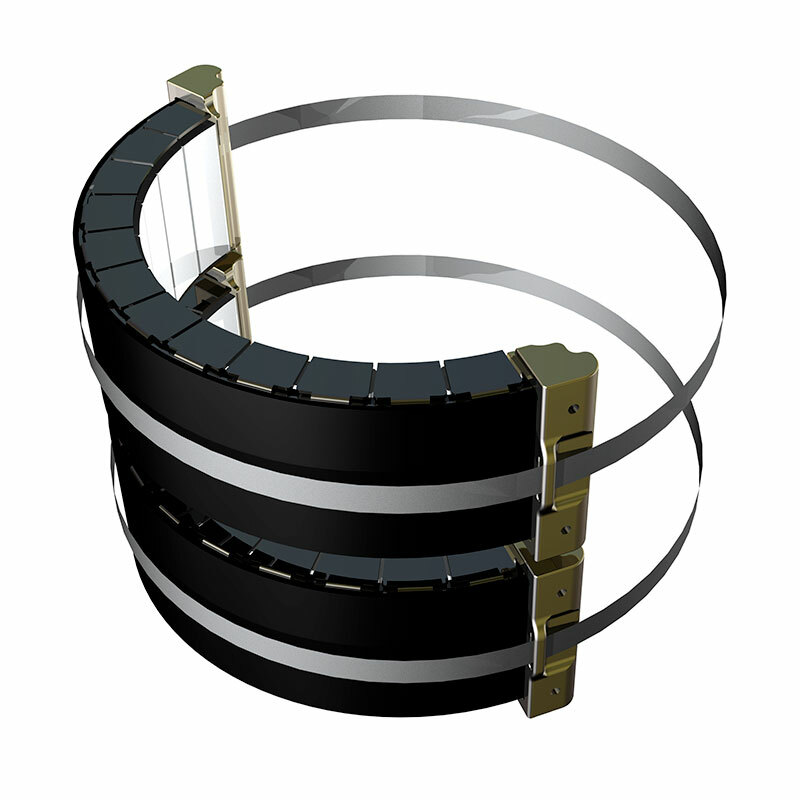 Alternate Stacked Installation using two band clamps. 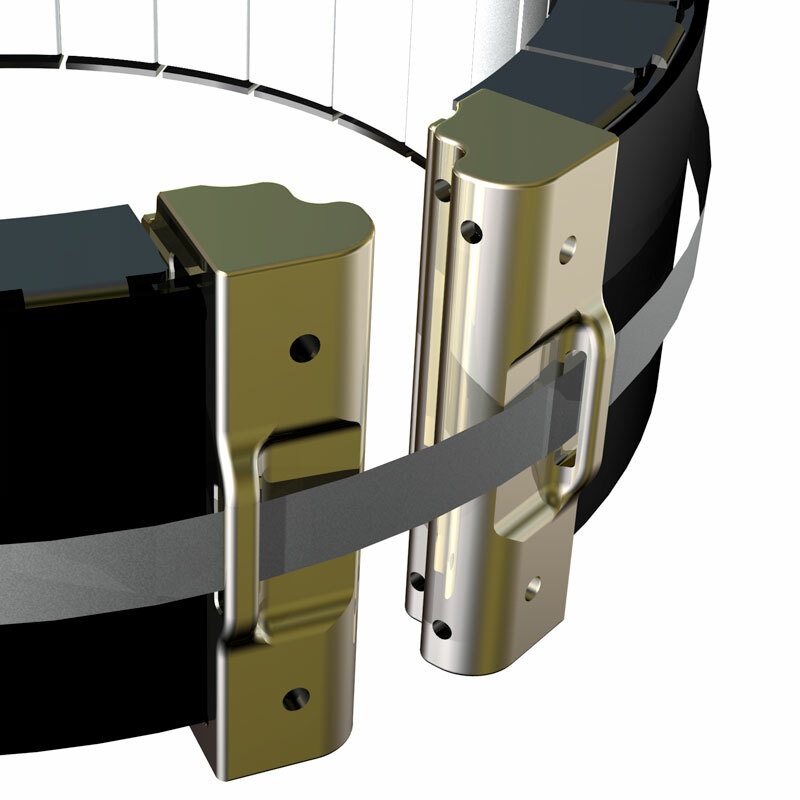 Detail showing band clamp installed through end cap slots. 1. Peel back a short section of adhesive backing on the supplied strip of extreme temperature silicone rubber*. 2. Carefully stick the end of the strip to the filter canister keeping it tight against the bottom of the FilterMags. 3. Continue peeling off the adhesive backing while working the strip around the filter canister until the entire length has been applied. 4. 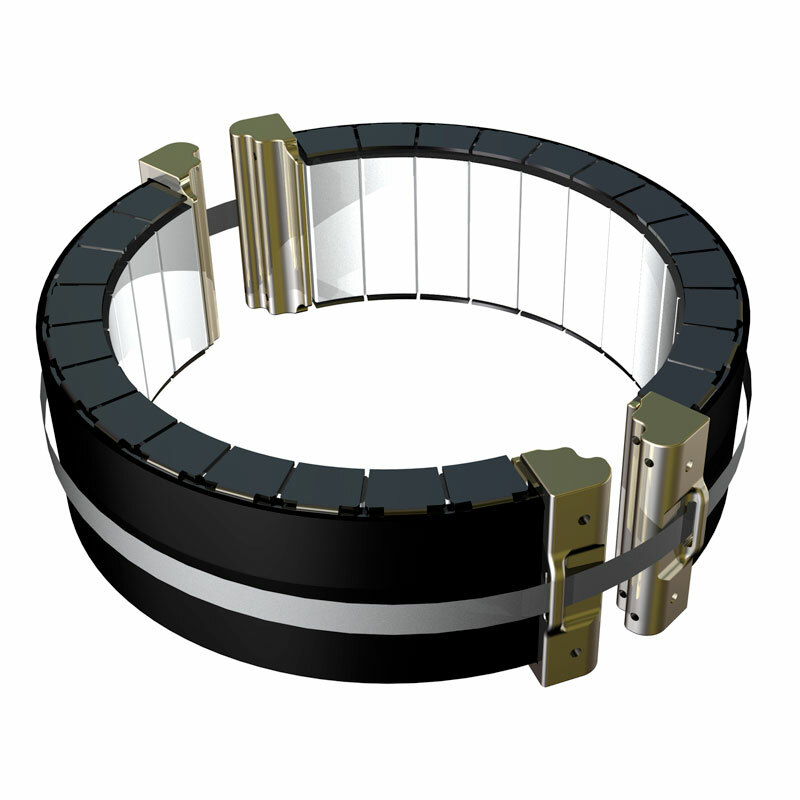 Place the supplied stainless steel band clamp over the silicone rubber strip and tighten in place to fully secure the Anti-Slip Band. 1. If your FilterMag XT is equipped with a factory installed stainless steel safety lanyard, simply attach the free end to a suitable attachment point. CAUTION: Ensure the lanyard will not interfere with any moving parts. If installed on mobile equipment make sure the lanyard does not hang down or stick out where it could catch on passing objects when the equipment is in motion. Extreme temperature silicone strip installed. Stainless steel band clamp securing silicone strip installed.